The Bible is replete with references to food, fasts, and feasting, containing hundreds, if not thousands, of verses involving the subject. 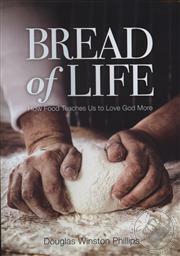 From Genesis to Revelation, food is part of the divinely inspired narrative and theology of the Word of God. 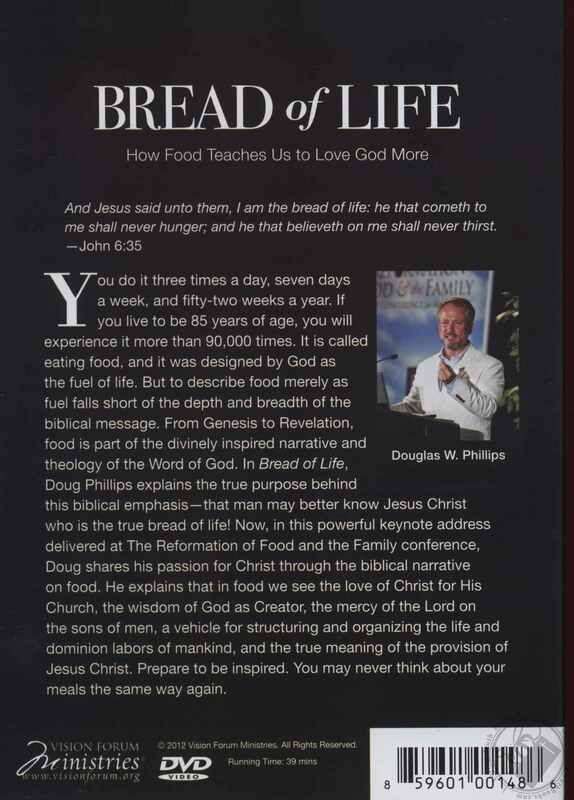 In Bread of Life, Doug Phillips explains the true purpose behind this biblical emphasis -- that man may better know Jesus Christ who is the true bread of life! Now, in this powerful keynote address delivered at The Reformation of Food and the Family conference, Doug shares his passion for Christ through the biblical narrative on food. 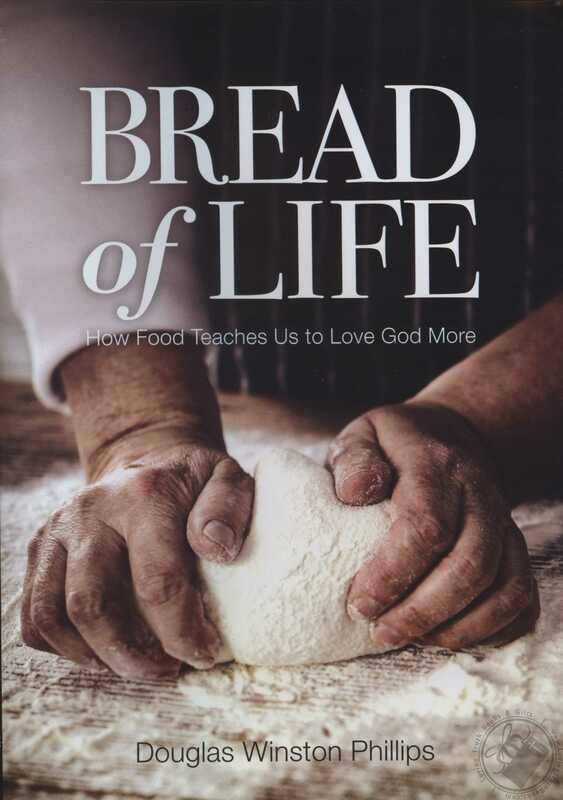 He explains that in food we see the love of Christ for His Church, the wisdom of God as Creator, the mercy of the Lord on the sons of men, a vehicle for structuring and organizing the life and dominion labors of mankind, and the true meaning of the provision of Jesus Christ. Prepare to be inspired. You may never think about your meals the same way again. Doug Phillips is a sinner, saved by grace. God was pleased to place him in the home of Howard and Peggy Phillips, two outstanding parents who loved him and poured their lives into him. His father personally discipled Doug for much of his life, taking Doug with him around the country, such that Doug had traveled with his family through 49 of the 50 states by the time he was 18. His father—a former candidate for President of the United States who served as Acting Director of the Office of Economic Opportunity under Richard Nixon—faithfully read both Old and New Testament to him at the dinner table, taught him constitutional law, public policy, and communicated to Doug a remarkable passion for history. They listened together to more than 2,000 audiocassettes on history, books, and theology. As a young man, Doug was also discipled by Robert Gifford, a great preacher of the Word and pastor of Sovereign Grace Baptist Church, who communicated to Doug a passion for Christian apologetics and the sovereignty of God. Because of his father's work as a statesman, Doug had the opportunity to spend time with, and learn from, many of the great Christian leaders of the last 30 years. It was during this time, however, that Doug came to realize that the greatest witness a man could offer for Jesus Christ was not what he knew, but how he lived his life as a father and a husband. It was at this time that God began to build a vision in Doug's life for seeing the restoration of biblical manhood, godly femininity, and the Christian home. While running a Christian newspaper in college, Doug met Beall, a young woman who ran a ministry to unwed mothers called "Alternatives to Abortion" (interestingly enough, Beall herself had been adopted). Five years later, on "the happiest day of my life—except for every day after that," Doug and Beall were married. Doug attended law school for the purpose of developing skills that would help him defend home educators and Christian parents from State tyranny. He graduated from George Mason School of Law, where he studied under judges Robert Bork and Doug Ginsberg. He served for six years at the Home School Legal Defense Association in multiple capacities including staff attorney and Director of the National Center for Home Education. In the Fall of 1998, Doug and Beall founded The Vision Forum, Inc. in San Antonio, Texas, devoted to producing books and tapes to help build up Christian families. Later, they founded Vision Forum Ministries (non-profit 501[c]3), a ministry designed to communicate a vision for the restoration of the Christian family and the rebuilding of culture for the glory of God. Much of Doug's time is spent teaching with the hope to spur on Christian manhood and sacrificial fatherhood, and to see dads turn their hearts to their wives and children.